Drenched in affluence, these Buckhead homes for sale have it all! An address in Buckhead, whether it’s for home or business, is a mixed blessing. Certainly some of the ritziest, even some of the bawdiest and most rowdy elements call this area just north of Midtown home. Still, through the years, Buckhead has held onto its claim as the most renowned and fashionable of all Atlanta neighborhoods. It has been called "The Beverly Hills of the East." Buckhead is, indeed, an exceptional place. It is a community that shines with vitality and vision. Buckhead is one of the country's largest urban mixed-use development areas, combining major offices, retail outlets, hotels, restaurants, entertainment spots and high-rise residential units within its commercial core. And closely surrounding its bustling business center, beneath a community-wide tree canopy, are serene and stable neighborhoods. Buckhead is a city by every definition except incorporation. With more of an upscale twist, beautiful homes, and great shopping, this is the area to thrive.Everything is here, and everyone is welcome. It's a great place to visit, to play, to work, to live. It's such a major part of Atlanta that if you don't know Buckhead, you don't know Atlanta! See all of the current homes for sale below, or keep reading to learn more about the Buckhead real estate market and why this area is more commonly known as the Beverly Hills of the East. Find the perfect home in Buckhead faster when you register for an account with the John Bailey Realty team. Save your searches, unlock advanced search tools, and have listings that match your preferences sent straight to your inbox. Buckhead real estate is ideal for those who hope to find a glamorous home with no expense spared. Buckhead's downtown area, generally demarked as the intersection of Peachtree and Paces Ferry Roads is clean and safe, and is home to many fine shops, restaurants and day spas. Arguably, both the city's best steak and finest seafood are to be found within a literal stone's throw of each other, the former lodged on the ground floor of the tallest building on Peachtree (Chops), and the latter set off by a four-story, cast-bronze salmon (some say trout) that towers over Pharr Road (Atlanta Fish Market). As you move away from the bars and shops of ground zero Buckhead, a growing battalion of high-rise luxury apartments and condos attracts the city's most prosperous up-and-comers. Gradually, small skyscrapers are beginning to dot the landscape of Buckhead's perimeter commercial area, as office space and Buckhead condos for sale are sold at an astronomical premium. If you're tastes prefer something more exclusive and private, perhaps a Buckhead estate is more to your liking. Some things resist change more strongly than others, however, and the tree-lined neighborhoods west of Peachtree, especially along Paces Ferry Road, live on as exquisite enclaves of old Atlanta money. Just a mile down this awe-inspiring stretch of road from the rollicking, disco-themed Have A Nice Day Cafe sits the august Georgia Governors Mansion. Many local celebrities and the families of early Atlantans make their homes in the wooded estates scattered hereabouts. A casual driving tour through these gently winding backstreets has a tendency to make one feel like a rolling prop in a pictorial out of Southern Living or Architectural Digest. The paradoxical proximity of these bucolic streets to crowded and hectic Peachtree Road is at the heart of contemporary Buckhead, and is perhaps what gives the neighborhood such wide, energetic appeal. If you're not in a strictly business rush (and your wallet doesn't mind), the central location and frenetic activity of Buckhead make it an ideal spot to stay. World-class hotels like the Ritz-Carlton and The Westin Hotel stand just steps away from the city's most elegant shopping venues in Phipps Plaza and Lenox Square Mall. In the illustrious mall of Phipps you can find some of your high end shops such as Gucci and Tiffany & Co, even a good movie at its AMC theatre or Legoland, a treat for your little one. Not only are the shops amazing, but the fine dining is more than appetizing! Phipps offers a fine range of good food such as Davio’s, a mouthwatering Italian experience. On Friday or Saturday evenings, you can find good company, music and delicious food at Twist or The Tavern at Phipps. A stop light away resides Lennox Mall. Lenox Square Mall is always busy with its multi stories, endless shops. Every year, Macy’s holds a Christmas tree lighting for the residents of Atlanta. One of the largest tree’s you could ever imagine sits high on the roof of Lennox Mall lit with lights and decorations. Another holiday treat is that during the fourth of July, Lennox has a beautiful fireworks display. If the restaurants, shopping, and nightlife aren't enough for you, never fear. The Atlanta History Museum sits at the center of it all on West Paces Ferry Road, watching the progression, keeping careful records of Buckhead's latest transformation. It's hard to believe you can be in the beauty, the comfort and the excitement of a place like Buckhead, and yet be only a few miles from central Downtown Atlanta and 'limited access, multi-lane' convenience to its international airport. Here you have open spaces, exciting entertainment and diversified dining; you can spend a day in the History Museum, tour beautiful residential areas and "shop 'til you drop." You will feel safe and welcome. Look around and you'll find many visitors from other parts of Atlanta who come here to dine, travelers from other cities in Georgia who are here to shop, and people from around the country and around the world here on business. Can you believe four luxury hotels in one suburban area? A little bit quieter than the districts of midtown and downtown, Buckhead’s residents and visitors love the convenience. Peachtree Street can take you all the way through Buckhead and get you to midtown and downtown in minutes. Almost every major hotel and business is on Peachtree Street. The facts speak for themselves: Atlanta's largest percentages of population and employment growth have occurred here year after year. 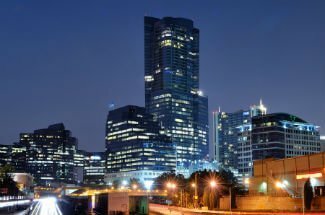 Buckhead had about a ten percent increase in its commercial space in recent years, when much of the country was talking recession. In fact, in 1992, Atlanta's Commissioner of Planning predicted Buckhead's business core tripled its1992 size by the year 2007! The reason: We now have access to the Interstate Highway system (and the rest of the world) through the extension of Georgia Highway 400. Buckhead is also a haven for entrepreneurs. Inc. Magazine identified Buckhead as the community with "the greatest concentration of small companies anywhere in the U.S." The latest national report, "Emerging Trends in Real Estate 2001" by Lend Lease Real Estate Investment and Pricewaterhouse Coopers, describes Buckhead as one of the "nation's best sub cities". Come on in, the opportunity is fine. For those that have their own business’s or wish to start one, Buckhead has the Buckhead Business Association. Since 1951, the Buckhead Business Association has been an essential part of the growth of Buckhead’s business community. The membership includes business and community leaders from every sector of our local economy with various networking and educational opportunities. Not all the big corporate companies reside in downtown Atlanta. Some of the most prominent investment firms and banks hold the fort of business. To learn more about Buckhead homes for sale or to requst more information about the Buckhead real estate market, contact the John Bailey Realty team today! Send us a message online or give us a call at 770.484.7888 today.